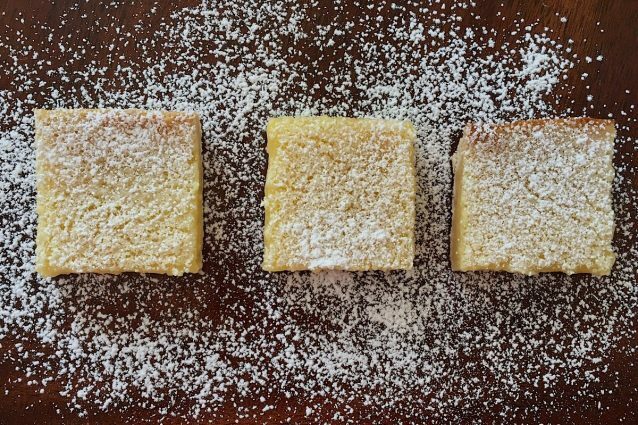 Lemon bars are the perfect light dessert for when you need something sweet and tangy. Made with real lemon juice, you will be able to taste the freshness of these bars within the first bite. The easy, three ingredient, buttery crust goes so well with the tangy lemon flavor. These bars also make a great dessert to bring to a party or to serve a group of guests. 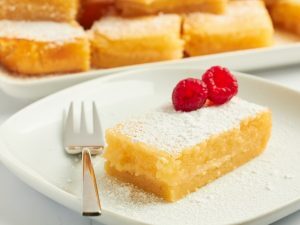 Cut then into small lemon bar bites or leave them large- either way will be perfect! In a stand mixer with a paddle attachment, cream the butter with 1/4 cup of sugar. Cream until light and fluffy, scraping down the sides of the bowl as needed. Add 1 cup of flour and mix on low speed until well blended. A nice soft dough should form. Place the dough in an 8×8 pan and press the dough into the bottom of the pan using your hands. If your hands are sticking to the dough, dust them with a little flour. Bake the dough in a 350 ̊F oven for 15 to 20 minutes or until it begins to turn golden brown. Pour the filling over the top of the pre baked crust and return the bars to the hot oven. Bake for 20 minutes or until the lemon bars are set in the center and no longer look liquid of wiggle when touched. Store in the fridge for up to a week and serve cold! -Make sure to whisk the sugar and flour for the filling well or the flour may clump when adding the wet ingredients. -While fresh squeezed lemon juice is best, bottled lemon juice will work as well. Make sure to purchase 100% real lemon juice however! – Mash 1/4 cup of strawberries into the bar for a pink lemonade dessert! Super easy 3 ingredients chocolate mousse!